Liverpool managed to keep themselves the title in this year’s Premier League campaign after a hard-fought victory at Turf Moor against Burney. The Reds trail Manchester City by two points at the top of the table with the hope of winning the title after 3 decades. 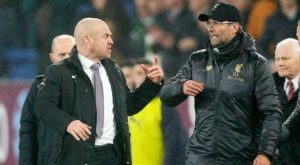 The victory at Burnley however was marred by a heated exchange after the match between the two managers after the game. The two managers shook hands at the final whistle but were involved in a heated exchange as they made way to their respective teams dressing rooms. Klopp was visibly frustrated by the rough tackling of the Burnley players, one of which left Joe Gomez and substituted in the first half. Gomez had to be stretchered off the pitch and it is unsure for how long he will be out of action. Phil Bardsley’s subsequent tackle on Alberto Moreno enraged Klopp and he spent most of the second half in Mike Dean’s ear. His Burnley contemporary didn’t exactly enjoy his touchline antics during the game and had apparently “scolded” the German over it at full time. Liverpool had to come back from being a goal down to win the match 3-1 thanks to goals from Milner, Firmino and Shaqiri to keep themselves only two points behind leaders Manchester City. The Reds travel to Bournemouth this weekend in what could be a tricky encounter.